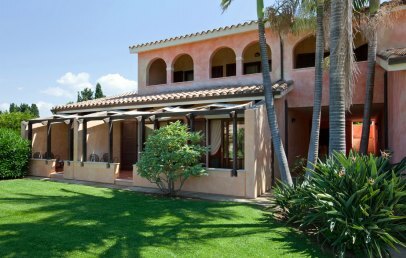 Set in a scented garden of Mediterranean plants, the Lantana Resort is at Pula, a well-known tourist resort in southern Sardinia. Just 1 km from the beach and a short distance from Nora, one of the most important archaeological sites in Sardinia. By car or by push bike you can easily reach several other charming beaches, the Golf Club Is Molas and a number of natural attractions. The Lantana Resort, whose architectural style recalls an ancient Roman villa, offers a warm family ambience but guaranteeing the maximum privacy, comfort and of course all the services normally associated with a top notch hotel. It is built over two floors and offers 24 rooms, a restaurant and several common areas. Its lush green external areas, which include a palm grove with over 100 palm trees of 15 different species, a variety of cactus plants and bush growth, also hosts the pool, the fitness centre, a putting green and a games area for the kids. The Lantana Resort prides itself on using clean energy produced by some 400 m2 of PV panels, while hot water is produced by 40 solar panels. 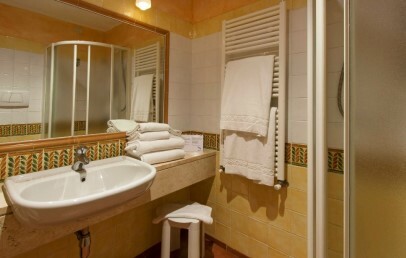 The rooms and apartments of the Lantana Hotel are modern and functional. All have a shaded patio or terrace furnished with table and chairs and garden view, air conditioning, Wi-Fi connection, minibar, safe, LCD satellite TV. On request are rooms reserved for non-smokers, rooms or apartment for guests with disabilities, rooms with connecting door. Double 19 sq.m. – french-size bed, bath with shower, located on the ground floor. Triple 26 sq.m. – double bed, sofa bed (3rd person) with bath with shower or tub, loacated on the ground floor. Apartment Hotel 40 sq.m. – apartment with Formula Hotel, with one bedroom, living room with sofa bed, kitchenette (on request, with supplement), patio or terrace of 15 sq.m. Check-in from 14:00, check-out until 12 noon. 2-Room-Apartment 40 sq.m. + 15 sq.m. patio or terrace, with one bedroom, living room with sofa bed and kitchenette and 1 bathroom. Maximum occupancy up to 4 people (extra bed on request). 3-Room-Apartment 50 sq.m. + 15 sq.m. patio or terrace, with 2 bedrooms, living room with sofa bed and kitchenette and bathroom with shower. Maximum occupancy up to 6 people. 3-Room-Apartment 60 sq.m. + 23 sq.m. patio or terrace, with 2 bedrooms, living room with sofa bed and kitchenette and 2 bathrooms one with shower, one with tub. Maximum occupancy up to 6 people (extra bed on request). All apartments Formula Residence have a full equipped kitchenette with microwave oven, fridge freezer, dishwasher, kettle, Moka, pots, plates, cutlery, cups, glasses, broom and dustpan; Moreover bed linen and towels for the bath, laundry rack, possibility to use the washing machine, dryer, iron with a supplement, located in common rooms. The linen are changed every 3 to 4 days, final cleaning is included and for a minimum stay of 8 nights a full cleaning is included. Check-in from 17:00, check-out until 10:00. Just 1 km from the hotel is the beach of Nora with fine white sand and gently sloping water – so ideal for the kids. Guests can take advantage of the free shuttle service to the beach (at established times and on request) and can rent beach umbrella, loungers and also small rubber boat by an external bathing establishment. Beach towels are provided free of charge with daily change for guests with Formula Hotel; for guests with Formula Residence the free change is every three days. The hotel also has its own 400 m2 pool (depth from 90–160 cm) with large solarium. At the Hotel’s small beauty centre guests can book face and body treatments, manicure, pedicure, relaxing massages and shiatsu. The hotel has its own putting green and table tennis table. Its favourable position allows guests to practice several different sports: golf from 9,18, 27 holes at the Golf Club Is Molas (free shuttle bus); mountain bike, snorkelling, diving, sailing school for adults and kids, windsurfing, kite-surfing, canoeing, water skiing. Not forgetting trekking, bird-watching and you can also book horseback rides. Dedicated to kids is a playground area with seesaws, roundabouts, slides and swings and, at the restaurant you will find a special kids’ menu. On request a babysitting service is available; from mid-June to mid-September, the kids’ club is open three days per week with entertainment and games in the swimming pool. The cost of the overnight stay includes breakfast. At lunch time a light-lunch service is available with hot pasta/rice dishes, salads, ham and melon, a cheese platter, filled rolls, snacks and dessert. For your evening meal, the Hotel Restaurant will tickle your taste buds with a selection of regional and national dishes which vary from day to day (choice of 2 – 3 first and second courses and a dessert menu). On request, we provide vegan and gluten free dishes. From June to September, once a week, we organise a barbecue of meat or fish while once a fortnight we arrange a dinner with typical Sardinian dishes, live music and folk dances. From June to mid-September there is an aqua-gym class for adults in the afternoon at the Hotel pool. On request, we can organise dives, boat trips, tennis lessons and excursions in off-road vehicles, on horseback or by mountain bike. We can also arrange for scooter, quad and bike rental. Wi-Fi connection, internet point and covered parking area are available to guests free of charge. Pets are welcome (not allowed around the pool or in common areas) with a supplementary charge of € 15 per day. 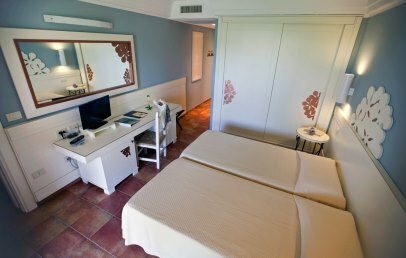 In the seasonal opened hotels some of the services could not be guaranteed during the low season and are subject to the discretion of the hotel management. Located on the ground floor. All are modern furnished and are comfortable equipped with air conditioning, Wi-Fi connection, minibar, safe, LCD satellite TV. The bathroom has shower, hairdryer. The rooms overlook the garden and have either a patio (7 sq.m.) with table and chairs. Located on the ground floor. All are modern furnished and are comfortable equipped with air conditioning, Wi-Fi connection, minibar, safe, LCD satellite TV. 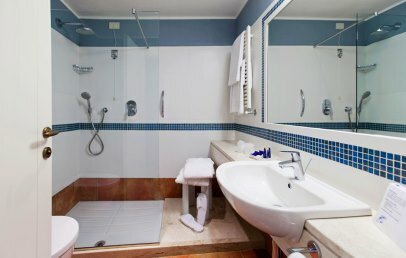 The bathroom has shower or tub, hairdryer. The rooms overlook the garden and have either a patio (7 sq.m.) with table and chairs. Spacious and well furnished apartment with a bedroom, living room with kitchenette (microwave, fridge with freezer, dishwasher, kettle, Moka, pots, plates, cutlery, cups, glasses) and a bathroom with shower or tub, towel heater, hairdryer, complimentary toiletries. The apartments on the ground floor have a patio that opens onto the Mediterranean garden and those on the first floor have a terrace with garden view. The fully equipped kitchenette can be used on request and has an additional charge, which is to be settled with the hotel. Spacious and well furnished, all 2-room apartments have one bedroom, a living room with sofa bed with a full equipped kitchenette (microwave oven, fridge freezer, dishwasher, kettle, Moka, pots, plates, cutlery, cups, glasses, broom and dustpan) and 1 bathroom with shower or tub. The 1-room apartments located on the ground floor have a shaded patio and the ones on the upper floor a shaded terrace. All equipped with table and chairs and overlook the Mediterranean garden. The apartments have bed linen and towels for the bath, laundry rack, possibility to use the washing machine, dryer, iron with a supplement, located in common rooms. The linen are changed every 3 to 4 days, final cleaning is included and for a minimum stay of 8 nights a full cleaning is included. 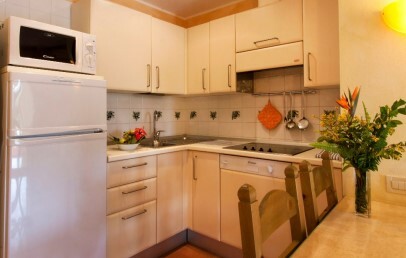 Spacious and well furnished, all 3-room apartments have two bedrooms, a living room with sofa bed with a full equipped kitchenette (microwave oven, fridge freezer, dishwasher, kettle, Moka, pots, plates, cutlery, cups, glasses, broom and dustpan) and 2 bathrooms (one with shower and one with tub). The 3-room apartments located on the ground floor have a shaded patio and the ones on the upper floor a shaded terrace. All equipped with table and chairs and overlook the Mediterranean garden.